Trousers for men rather than breeches or pantaloons were introduced to England in 1807. They had their origins in long loose garments worn by sailors and working men and when they were first introduced they were very informal and were worn at seaside resorts or countryside retreats. Initially they reached the ankle but by 1817 they were worn to the ankle and it was fashionable to have a strap worn under the foot. By 1825 trousers had come into everyday wear. 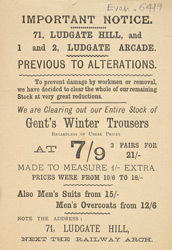 Until the mid 1800’s men’s clothing like trousers was hand made by tailors but after the introduction of the sewing machine mass production was possible and clothiers like the one advertised in this leaflet sold a variety of sizes.